The picture above is of the latest additions to my arsenal in the War On Writing. Yes, you read that right....I'm waging a "war" on writing and won't consider myself "victorious" until I'm finished with my latest WIP. Up until recently, I've been using Yarny, Microsoft Word, and Google Docs to aid me in my battle. There isn't anything wrong with these methods, mind you, but now I think it's time to go "old school" and get back to basics. I've had the blue spiral binder for about a month and it's pretty handy. It's a three subject binder with double pockets separating each subject. The first has been designated for character profiles, town background, etc. Basically, world building things. The second is for outlining and general notes. The third has yet to be determined...maybe doodles or something...I don't know. The two composition books were found at the local CVS, two for five dollars, so I grabbed a couple. I'm not sure what I'll be using these for...maybe more specialized notes? The pens are some cheapy (a pack of ten for a dollar something, I think) Paper Mate Eagles, which write remarkably well. So what if they have caps instead of clicky-clicky things? Anyway, I've been putting these to good use and have found it a bit liberating to be able to "work" on my project while outside or at the pool or any other place I don't want to lug the laptop to. My one rule in using these tools is to always write in pen. If I don't like an idea, I just put a single, solitary, line through it. Who knows when I might go back and think it wasn't such a bad idea down the road? How about you....anyone else still use some of the more mundane methods to help with their writing? Until next time, wish me luck as I storm the beaches and try to conquer my war on writing! no retreat and no surrender my friend.... are as Winston Churchill one said never give in, never give in, never, never, never! You'll have to win this war battle by battle. Good luck. Regarding writing methods, I've found that handwriting my first draft of anything will be easier if I do it by hand. I don't know why, but the words just flow better. The horrible part is going back to type everything up. I have terrible handwriting. I have some handwritten notes, but I am not nearly as organized as you. Battle On! 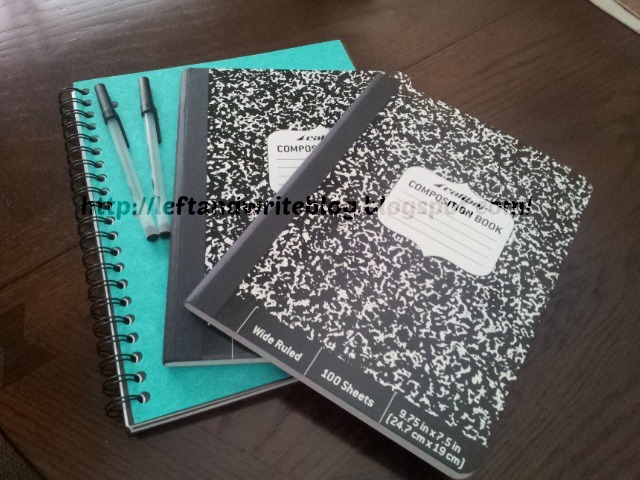 I just wrote a post about stocking up on composition notebooks (my weakness and WalMart and Target had them for .50!). I love writing in long hand. I love the mobility of it and the way it connects my thoughts, heart and body. Go you-- may the writing force be with you. I still have a lot of spiral bound notebooks and marble ones, too but I don't use them unless I go on vacation. I always have a notebook that I use to carry with me and work on my backup project. My primary project is done on the computer. Almost every scene I write starts out handwritten in a spiral bound notebook. I have a couple of the composition books, too, but the spiral bounds get used more. And I have a major pen addiction. Caps are just fine, but I do love those clicky tops. @Mr. K: I'll be taking Mr. Churchill's advice! @Jennifer: Yes, definitely a 'battle by battle' type of war to wage and, if it makes the process easier, keep on doing that first draft longhand....though I know what you mean about the handwriting...mine is pretty horrible, as well. @Julie: Oh wow, just read that and don't feel alone...I can see where you're coming from. In fact, I saw a commercial where Staples is having a sale on notebooks for a penny (after a $5.00 minimum purchase)...so I think I'll be stopping there this weekend! @Andrew: I need to start doing that, as well. Going back to basics. Yup, handwriting helps to be more creative. I like going old school and using pen and paper every now and again. I carry a notebook and pen everywhere because you never know when you'll find a bit of time or a good idea. I have a very specific pen I use though. I'm kind of a snob and won't use anything else, even if it's free. And that's saying a bit. I've always been old school so welcome to the club. Doodles, ha! I happened into Walmart and 50 cents a notebook.... Julie also said that. a couple years ago they were 10C at school time. Even though I'm not trying to write a book, I always stock up on notebooks. I'm a note taker.... on everything. I love my notebooks and my pens. Thank goodness they're not quills anymore. Here's my Good Luck to you. I posted about this on Wednesday :) Give me pen and paper any day, even though it's doubling up. I feel more creative going old school.I associate the computer with too much other stuff! Until NaNo 2010, that's the only way I wrote. I write my novels on the computer now, but when composing guest posts and such, I always write them out by hand first. Love Koopman's comment, and now I'm not sure what to add . . .
Go storm those writing beaches!!! Win that war! Use any tools necessary! (And yes, I pull out a notebook - it's for the writing that keeps me going through the manuscript - the crazy ideas, stress moment journal entries, random thoughts, etc - it's kind of a sanity saver and idea holder all in one. Pens and paper still work! Have fun storming the writing castle! I'm kind of in love with notebooks and have a ridiculously large collection that I'm slowly working my way through. For the most part I write on the computer, but I use my notebooks to generate ideas when I'm first starting a project; when I want to get meta and analytical about my WIP; to get myself unstuck when I hit a block; to collect thoughts, ideas and scraps of dialogue. Your composition books are delicious. So happy-making! I've always used notebooks. I think better when I write by hand. On the computer, I feel pressured to make my words perfect, and that's just not going to happen. My books of choice are those small journals. I have dozens filled and many more waiting for me. Help me! There's that use of "WIP"! I had no idea that Google had Doctors. Dude, I use pen and paper on a regular basis. Mostly to go through the huge list of bloggers I visit. I tick of each name after my visit. Which Means, I shall be about to tick you off in the nicest possible way. Writing anarchy is the way forward. I, too, have just gone back to using a good old fashioned notepad and pen for my writing. It's quite liberating and a lot more portable. I used to do notebooks. It is all digital now. I do alternate between writing on my desktop and laptop it is nice because it gives me a change of pace. I still have all my notes though for languages and histories for my fantasy world. You are making me miss my notebooks. Good luck with finishing. i always put my first draft in a notebook. love working on it anywhere and everywhere, jotting notes, adding research, etc. messy! then i put it all together on the computer. @Suzanne: I think it's worth the little extra work, if it helps to organize the thoughts better. @Alex: I used to use an electric typewriter and longhand before that (mainly due to lack of options..hehe). You still write out blog posts? That's an interesting process...hmmm..
@CA: Never heard of that...I'll have to check it out, thanks! @Nancy: That's a great idea, as well, thanks! @Rosey: Yes, I agree....much more authentic. @Tara: Thank you and I like that idea. I can also see how it would be easier to try to organize when you finally sit down to 'go digital'. I love having notebooks with me. Frees me from the desk and the computer! Good for you and here's to finishing that WIP! Battle on Mark! I love the comp books. This week at Staples they were on sale for ten cents each. YEP, just .10 each. I bought a crap ton for me and my girls (for school). I think I am going to steal you're idea of writing in pen and then only crossing it out with one line, so I can go back and read what I originally wrote. I really like that idea! Very smart. @Lee: Nope, never anything wrong with 'cutting the cord'...and thank you! I am kind of obsessed with notebooks and addicted to the back to school aisles at the store. But then I get all these pretty supplies and still end up just writing on my laptop. I guess I just love the idea of the notebooks more than actually using them. I so want to go into battle with you! I'm collecting my arms and will see you on the battle field, wielding a mighty pen. WE SHALL BE VICTORIOUS! I like the retro feel of using a notebook, but I dread retyping. You can't beat the price though. I used to love to write in journals, but my hand cramps up from arthritis when I write too much. Happy to hear of your new freedom! I hope you are now winning the war! Mark, we two must be on the same wavelength. I too started writing on paper to kick start my creativity which was kind of low. I try to keep a notebook, but I haven't been faithful to the practice yet. Have a good weekend! With back to school sales on, I've been so tempted to go out and buy some composition books. But I still have a lot of empty ones from past years. I do almost all my writing on the computer. On rare occasions if I'm away from home I might write in a spiral bound composition book. I really do want some of those non-spiral old school composition books though. I'm coming rather late to the party, but I've got the same supplies. In them, I write ideas and descriptions, then take it all to my laptop later. Hate to rub it in, but I just got one of those composition books for 50¢ at WalMart. Way to go back to the basics to get the job done!